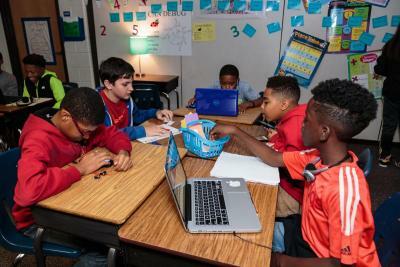 Gwinnett County Public Schools (GA) has a lofty vision for learning technology. The school district’s Strategic Priorities for 2010-2020 call for “technology to permeate the education of Gwinnett’s learners.” To achieve this vision, Tricia Kennedy, Executive Director of eClass Transformation, is leading a cross-divisional team with Mark Walls, Executive Director of Department of Information Systems and Solutions, to develop and implement a digital curriculum ecosystem known as eClass. eClass will encompass many different functions including digital content, learning, and assessment systems as well as professional development resources, student information and gradebook functions. Developing buy-in from all stakeholder groups for eClass was an important part of the work. Kennedy and Walls knew the vision for eClass would not be successful if it did not have an intuitive infrastructure. “Within a couple of months of starting conversations, we recognized we were going to have a siloed, compartmentalized infrastructure if we didn’t start working towards interoperability,” says Kennedy. “We want to continually find ways to increase the effectiveness of teaching and learning through employing improved learning technologies." eClass is envisioned to meet the evolving needs of students and staff, facilitate teaching and learning, enhance communication, strengthen the link between school and home, and ensure operational and analytical excellence in the day-to-day operations of the school system. Tricia Kennedy says, “As we began to put the tools and resources for eClass together, we quickly realized we needed a way to make the entire ecosystem work together.” As a result of this insight, Gwinnett joined IMS Global Learning Consortium (imsglobal.org), a nonprofit membership collaborative devoted to enabling digital transformation through a plug-and-play architecture. IMS Global’s members collaborate together to develop standards to enable fully integrated digital learning environments. At the highest leadership level, including the superintendent and his cabinet, the eClass team spent time explaining the need for a plug-and-play architecture. The eClass team had IMS Global staff meet with Gwinnett’s technical team as well as with the senior leadership team to help outline a strategy to enable a plug-and-play ecosystem. As a result, the district’s team leaders gained a greater understanding of the need for interoperability and became champions for interoperability. The technical team expanded their expertise in implementing an open architecture and developed a roadmap for how the interoperability standards would help achieve Gwinnett’s goals. One of the key elements of the plan included determining which products were IMS Global certified and which vendors had plans for their products to become certified. Products which have been tested and are certified to meet the standards are listed in the IMS Global Certified Product Directory (imscert.org). Today, there are nearly 400 products listed in the directory. Gwinnett found that the standard Learning Tools Interoperability® (LTI®) was particularly suited to their needs. The principal concept of LTI is to establish a standard way of integrating rich learning applications with platforms like learning management systems. Gwinnett has certified their eClass portal to the LTI standard. The basic use case behind the development of the LTI specification is to allow the seamless connection of web-based, externally hosted applications and content to platforms that present them to users. In other words, if you have an interactive assessment application or virtual chemistry lab, it can be securely connected to an educational platform in a standard way without having to develop and maintain custom integrations for each platform. Together with other members of IMS Global, the Gwinnett eClass team developed procurement processes and documents to let vendors know the district’s expectations for interoperability. “When talking about textbooks and digital content, we have a cadence that we use because those adoptions happen every year. We give our vendors the IMS Global standard specifications during the bid process and we expect them to demonstrate their products are IMS Global certified,” says Kennedy. She continues, “Sometimes we have to deal with really specific needs instructionally and so we try not to draw a line in the sand with a vendor on conformance and certification, rather we partner together with the vendor to help bring them along.” This has been a very successful process for Gwinnett. Most recently the district has begun to stop the error-prone burden of manually creating unique class roster data extracts for every digital text, web publisher, and platform provider and duplicate data entry of grades by implementing the IMS Global OneRoster® standard. OneRoster is the standard specification for securely sharing class rosters and related data between a student information system (SIS) and any other system, typically a content application or learning information system (LMS). The OneRoster standard supports spreadsheet-style (CSV) export-import as well as direct system exchanges using REST API’s. With OneRoster, schools pave the way for digital resources for teaching and learning and eliminate rostering problems before they happen. With increasing digital resources, comes the understanding that home internet access plays an important role in extending learning beyond the school day. Kennedy says, “Students’ access to learning resources outside of school plays a pivotal role in the school district’s decisions about which learning resources to acquire and how to use those resources well. 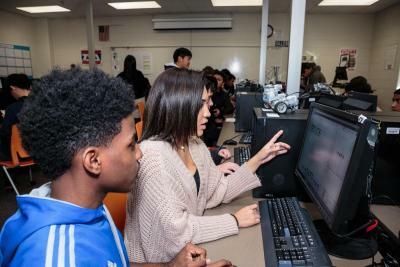 Gwinnett’s foremost commitment is to make the most of school hours.” Beyond that schools in the district are working with parents to help them understand the value of access from home. Kennedy says there is a noticeable increase in percentages of families reporting access from home. For those that may not have any way to access digital content at home, teachers are making arrangements for students to have time during school hours for access or are providing alternative assignments.